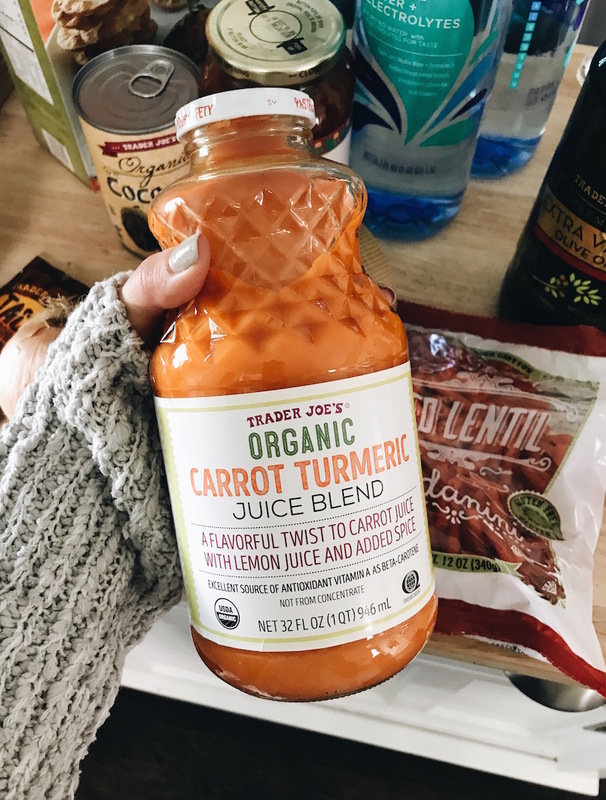 I start my day with this carrot turmeric juice. It’s anti-inflammatory and boosts your immune system! Sometimes I add extra lemon juice too! 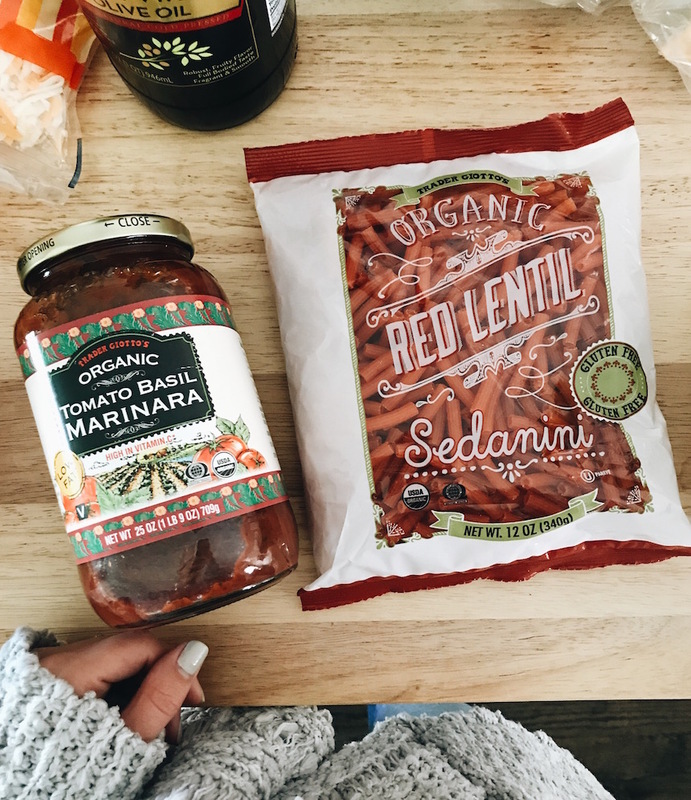 Their marinara sauce is yummy and Cam is obsessed with pasta so I swap it out for the red lentil version. Add some chopped spinach, mushrooms, and asparagus for a easy/healthy meal. 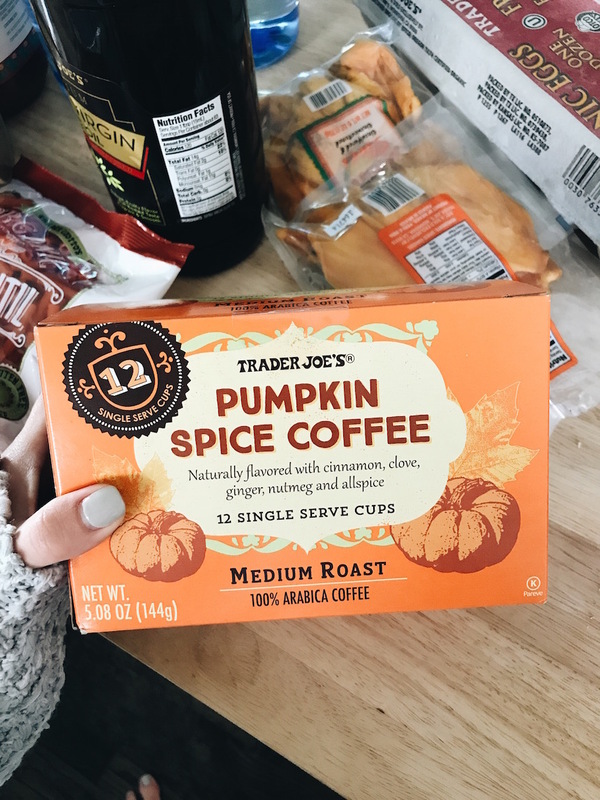 I’m not big on pumpkin spice but my mom bought this while she was staying with us and it’s actually really good – there’s just a small hint of it! 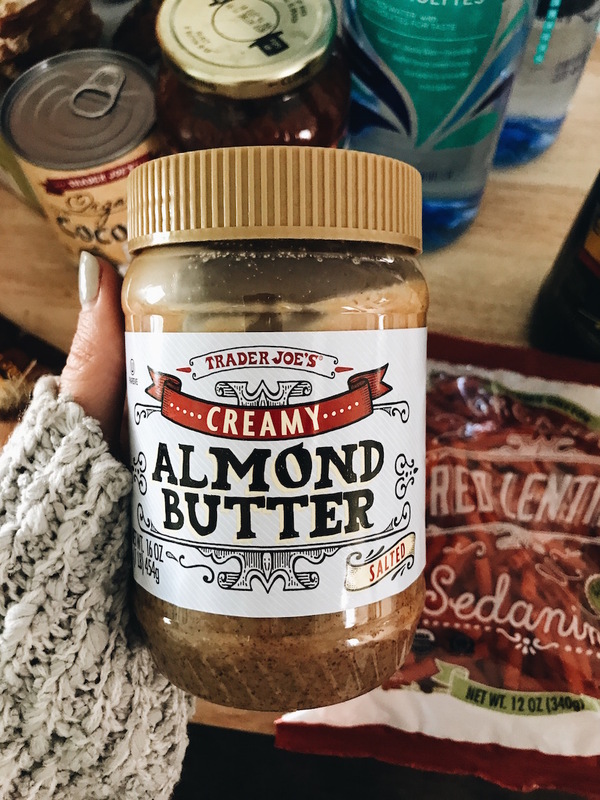 I was a peanut butter addict (my favorite after school snack was PB off the spoon) and didn’t like almond butter until I had this one. It’s so creamy and flavorful, I don’t even miss peanut butter! They have the best seasonings. The everything but the bagel is my favorite – I put it on avo toast, eggs, steamed veggies…pretty much anything because it’s amazing. A few of Cam’s favorites that I keep on hand. Wish I was that mom that made all their kids meals from scratch buttttt I’m not lol. The reduced gilt mac-n-cheese is SO good. 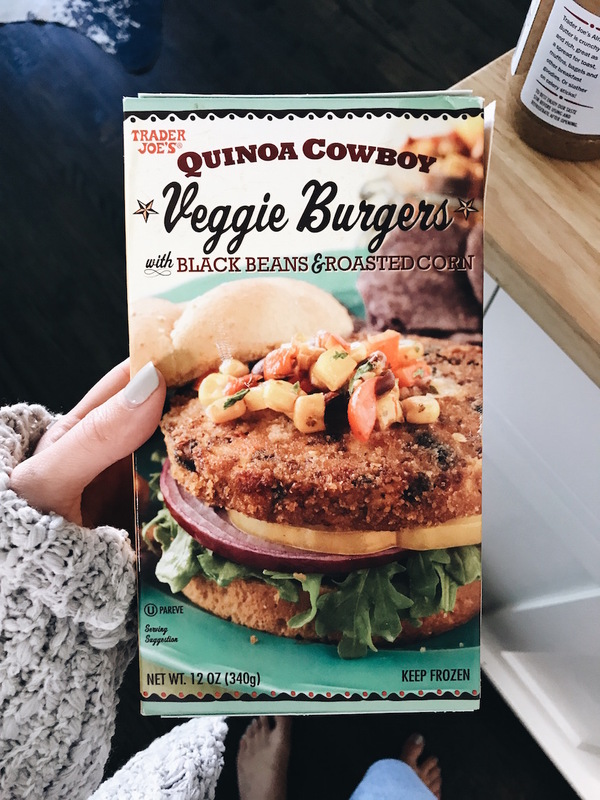 Love these quinoa burgers for when I don’t feel like a big lunch! 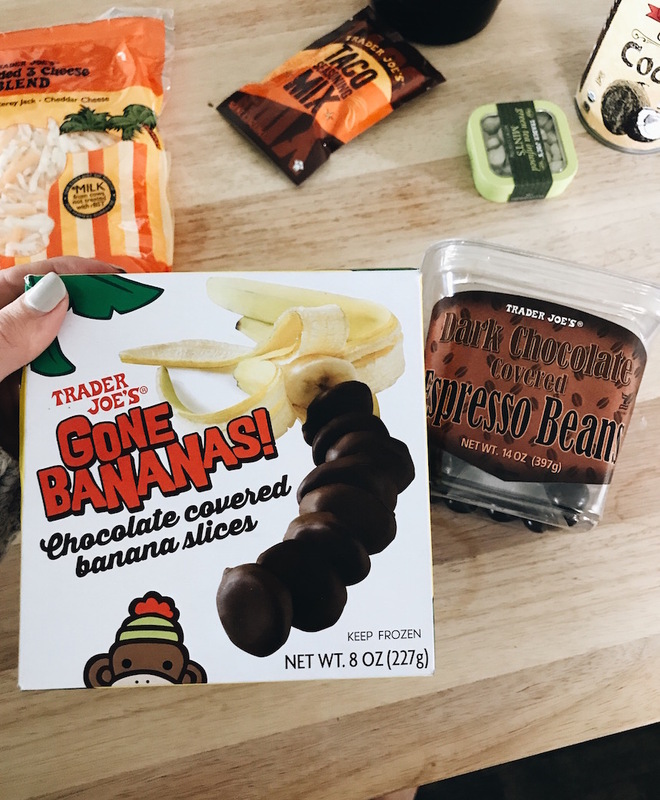 A few sweets I love: frozen banana slices (so good), dark chocolate covered espresso beans, and mango slices (very addicting, don’t start if you haven’t already lol). I also love the mochi ice cream balls and their gummy bears – even better frozen! 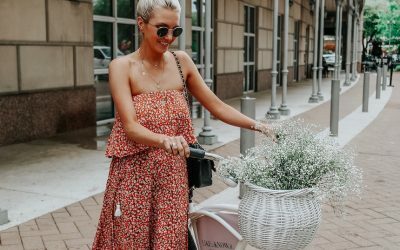 We drink tap water at our house and one day I decided to check how clean the Dallas water is and was disappointed to find out that at least 10 cancer causing contaminants are in it (enter your zip code here to check your city). 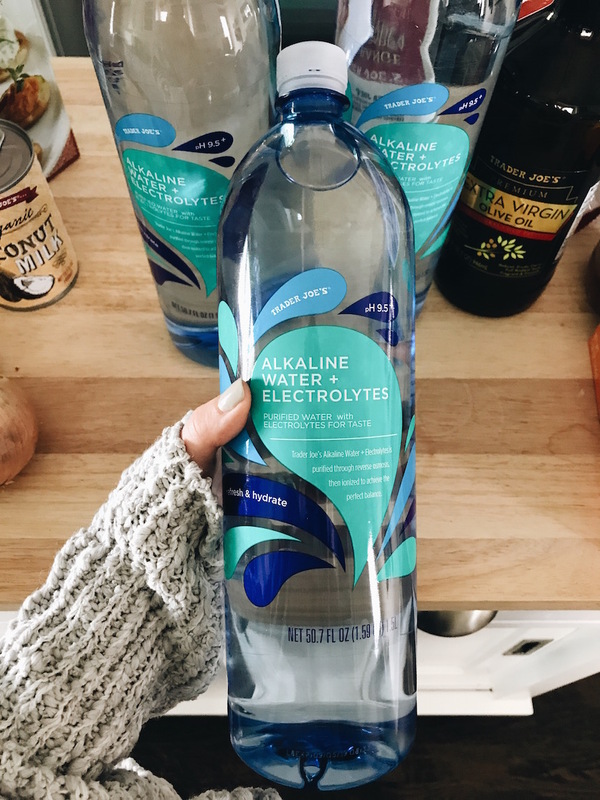 We’re getting a water filter but for now I’ve been stocking up on TJ’s alkaline water. 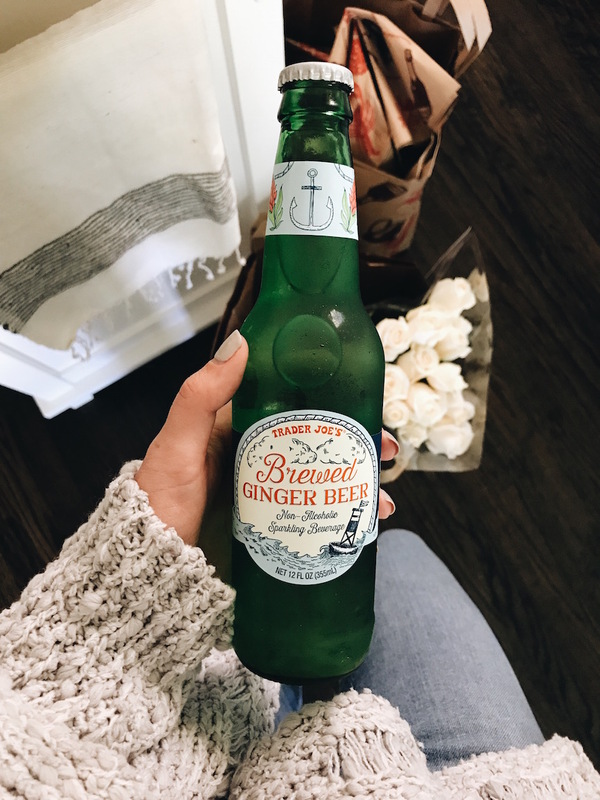 The ginger beer is soooo good. Love it for moscow mules or just by itself. 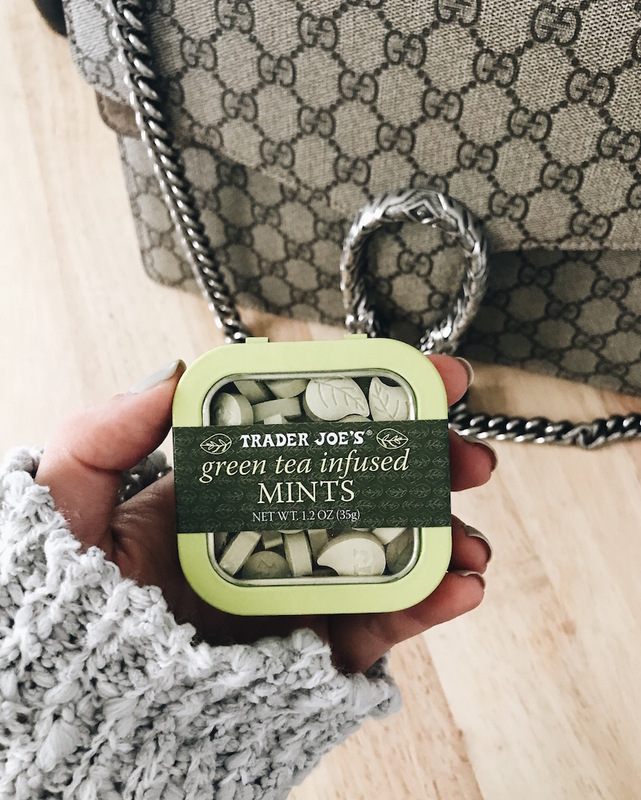 Most mints are way too overpowering for my taste but these are light and refreshing! Some honorable mentions that aren’t pictured: green dragon hot sauce, cauliflower rice, pita crackers with sea salt, eggplant hummus, frozen orange chicken, jalapeño limeade (amazing marg mix), plantain chips, and the chile lime chicken burgers. 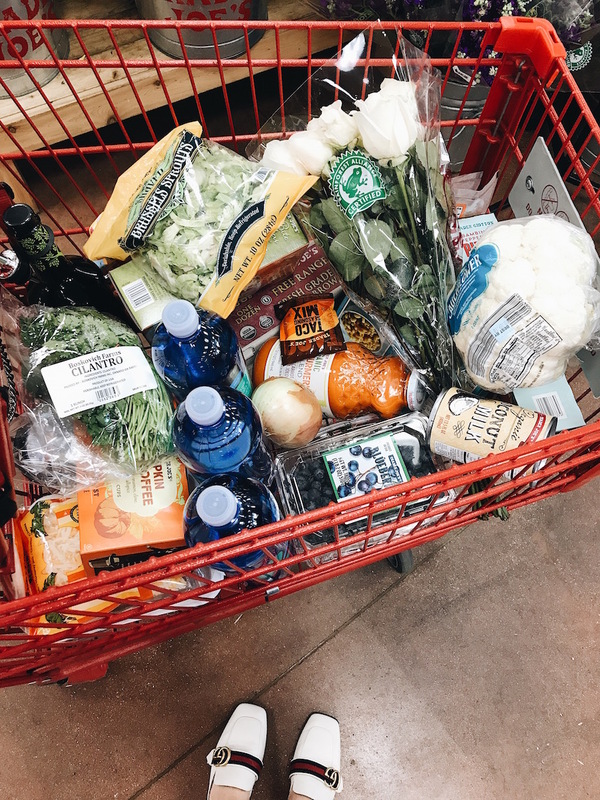 What are some of your favorite TJ’s buys? If you love the mango slices & the jalapeno limeade mix, you need to dry the chili mangos! It’s so good I’m banned from buying them because I can’t stop, won’t stop.. If you’re a tea drinker, the ginger turmeric tea is really good too! 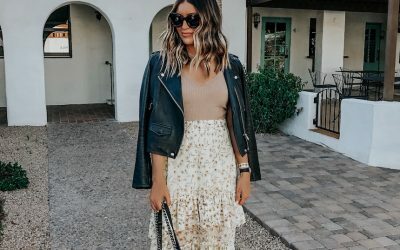 Thanks for the recs! The tri-colored tortilla chips are so good because they aren’t quite as salty as regular tortilla chips, and the sour cream and onion version of what is basically Pirate’s Booty is so dang good you should never buy it because you’ll eat it all haha! Totally agree on the mango slices being the bomb and their almond butter really is some of the best and such a good price compared to some other places! Also, I owe you big time for introducing me to the Everything But The Bagel seasoning via your Insta-stories because I eat avocado toast at least 2 or 3 nights a week (#idontcook) and it makes all the difference!!! You should try their soyrizo. It’s the best I’ve found! Those mango slices are AH-MAZING! 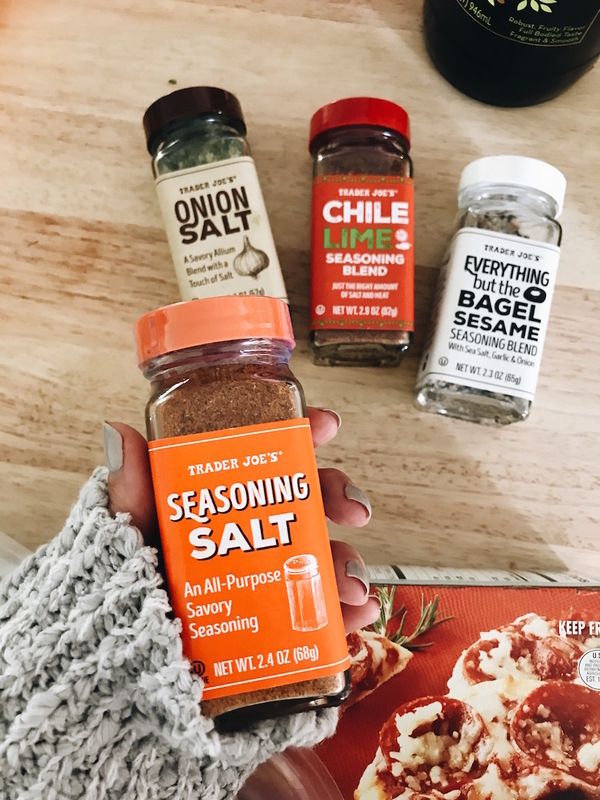 The seasoning salts are my go-to’s! I love them for snacks and to season main dishes. I also love all of TJ’s pasta sauces. We eat a lot of tortilla chips and salsa around here so we buy a lot of it at TJ’s. 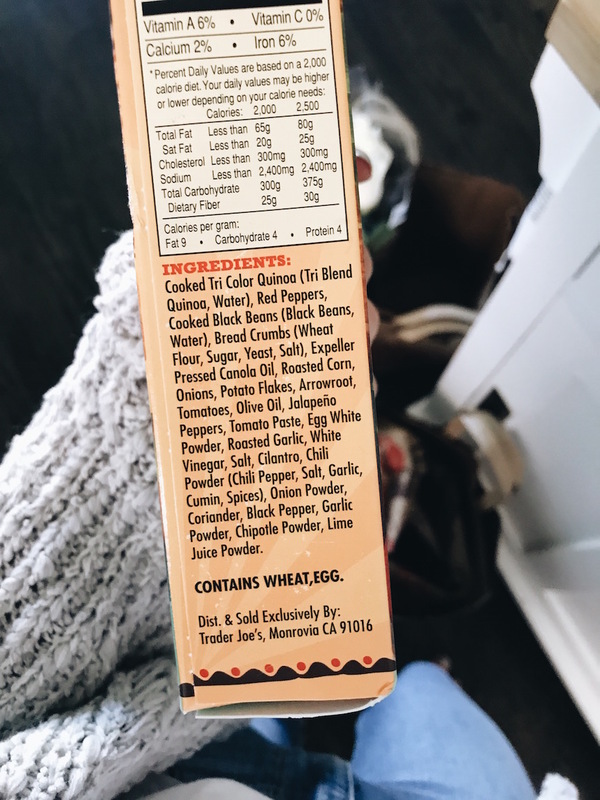 I love a couple of their tortilla chips because they are naturally low cal and have an ingredient list of about 6 items. Also I buy frozen side like this super food side that is basically kale, sweet potatoes and quinoa so I don’t have to think of a side to cook with a protein just pour the bag into a stove top pot and cook for five minutes while something like salmon with lemon bakes in the oven. And of course flowers., always flowers and hummus. forgot to include a pic of the spread! I have an AMAZING dish for you to try that is too easy. 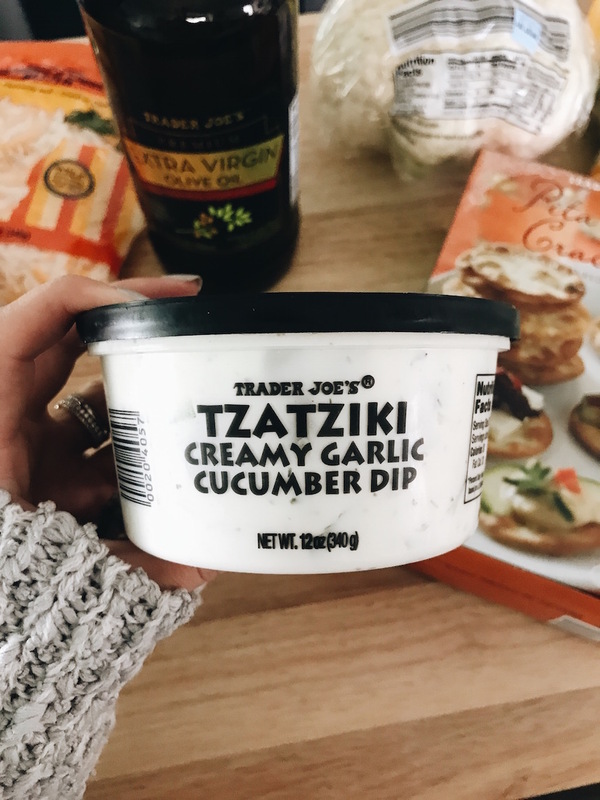 TJ’s cauli rice + TJ’s garlic spread-dip (picture linked below) + Parmesan cheese. 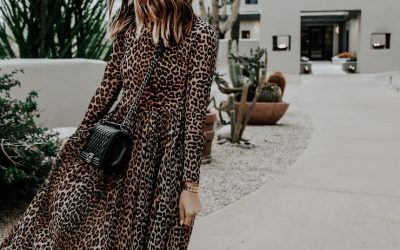 Trying that for sure – thank you!! We keep those espresso beans in the freezer! Great 4pm pick me up! Just put mine in the freezer, thanks for the rec! I love this post! 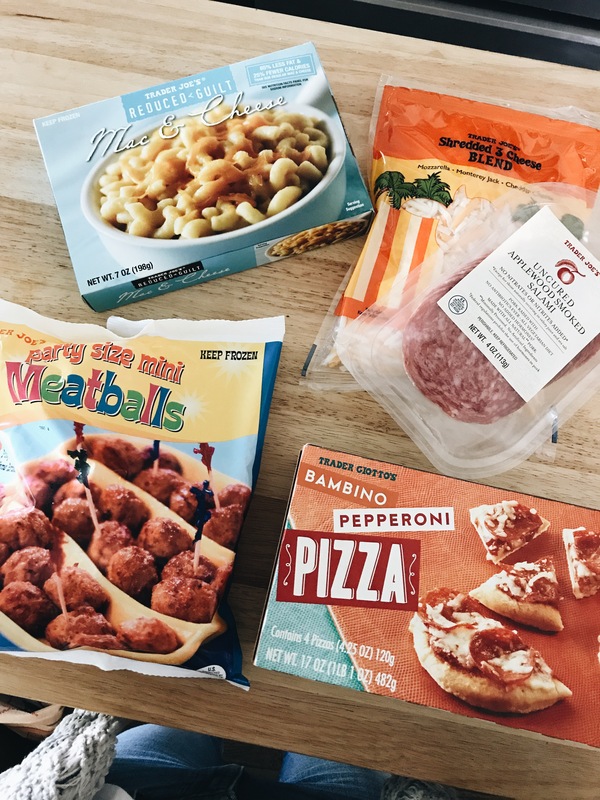 I am from Canada so we don’t have a trader Joes here but I do travel to buffalo for shopping and always like to pop into target and tj’s for the grocery goodies! 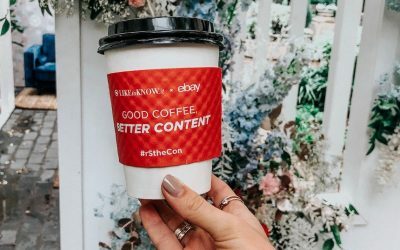 Will be going soon and will be sure to pick up your recommendations! 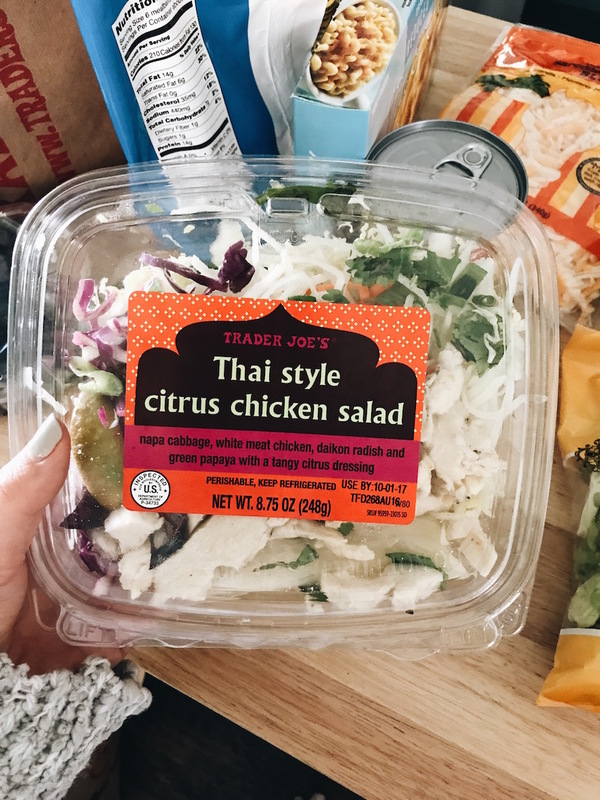 Love Trader Joe’s! I always go to the one off of Preston Hollow. Be sure to try the Superfoods Pilaf for an easy side, and the Acai unsweetened packers to add to a smoothie. So yummy! The mango slices are ADDICTING! My other favorite from TJ’s is the Roasted Garlic & Onion Jam .. so random but crazy good! Put it on top of a cracker w/ Brie Cheese … YUM! OMG yes my mother-in-law buys this. SO GOOD! For #coffeetalk We just moved into a place that has a kitchen island and I need counter height chairs. What are your favorites? Such good choices! 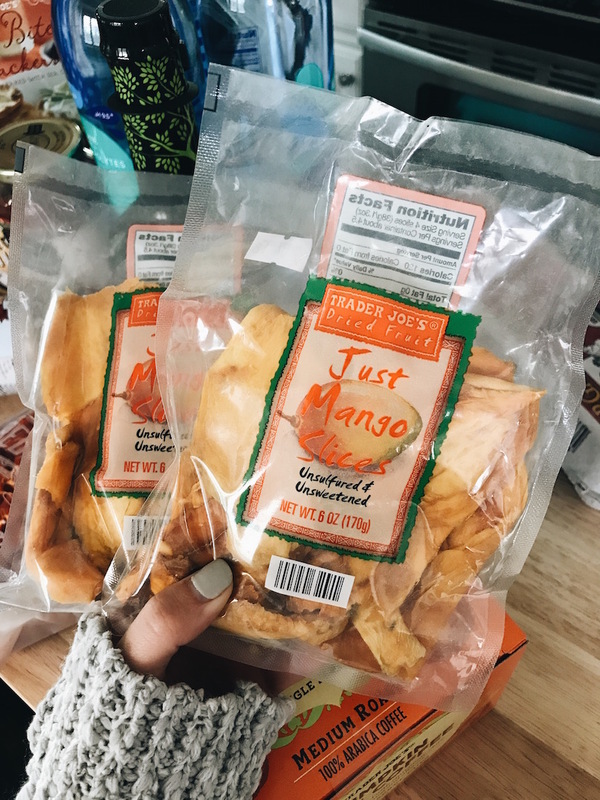 And you’re right about the mango slices – it’s hard not to eat an entire bag in one sitting. LOVE so many of these too! 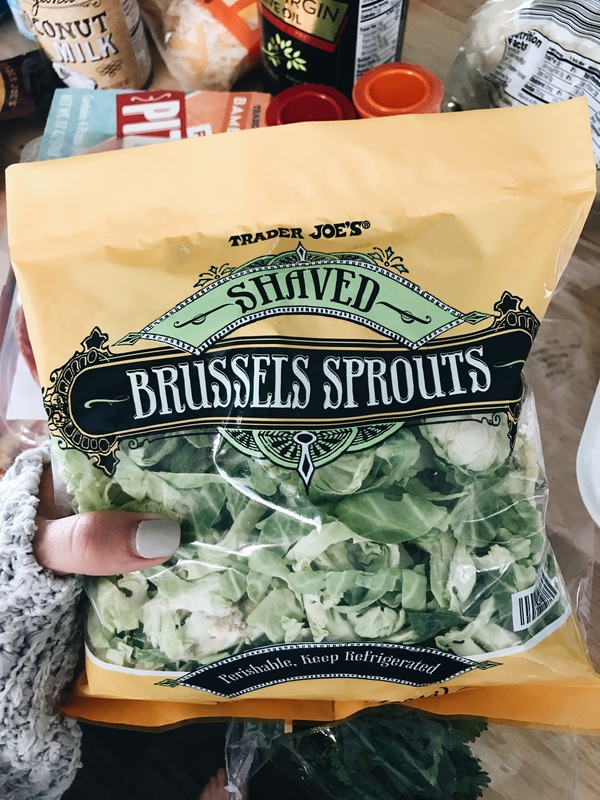 We always have to have the plantain chips, mango slices, quinoa burgers, and shaved brussels in our stock! DEFINITELY need to check out those frozen bananas!